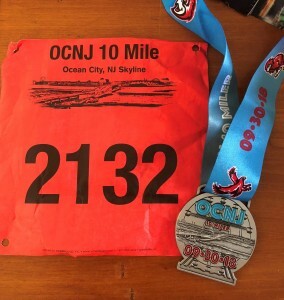 My first full week with my new oral chemo had me feeling good enough to jump into the Ocean City New Jersey 10 miler. And I felt beyond great. It was just a perfect day with much to be thankful for. Especially my wife Mary Grace for always being ….. everything. I could never do what I do or fully be who I am without her love and support. And thanks to the OCNJ Half Marathon 10 Mile Run/ Walk and 5K crew and all the volunteers for another outstanding event. If I’m now seeing my new normal on ibrutinib, I’m extremely optimistic because this normal is better than what I thought normal was when I thought my old normal was good. Follow that? And who can’t love a well run race that’s 5 miles from home with free parking 20 yards from the start and 50 yards from the finish!! The race itself is a crazy beautiful one that hugs the Ocean City coastline and boardwalk. It’s quite familiar territory that I run and bike on all the time. It was great racing there, feeling healthy, on such a perfectly picturesque morning. This entry was posted in cancer, running and tagged ibrutinib, imbruvica, janssen pharmaceuticals, johnson & johnson, ocean city 10 miler, ocnj, pharmacyclics, snow companies, survivor. Bookmark the permalink. Both comments and trackbacks are currently closed.